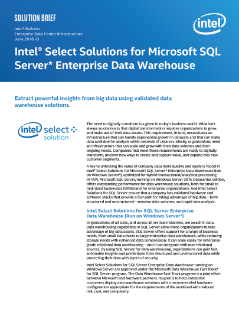 Intel® Select Solutions for SQL Server* Enterprise Data Warehouse ensure that a company has validated hardware and software stacks that provide a fast path for taking advantage of big data—both structured and unstructured—massive data volumes, and rapid data analysis. Proven to scale with Intel® Xeon® Scalable processors, these pre-tuned and tested configurations are workload-optimized and let ...organizations deploy the optimum data warehouse infrastructure quickly and with less tuning. Deliver a simplified data center infrastructure with workload-optimized configurations for fast and easy deployment. Montefiore Health System's data analytics platform, built using Intel® Xeon® processors, enables real-time patient analysis. CSPs: Open new revenue streams by helping your customers derive maximum value from their data. Through a private cloud solution, OHSU is enabling precision medicine and advancing the fight against cancer.